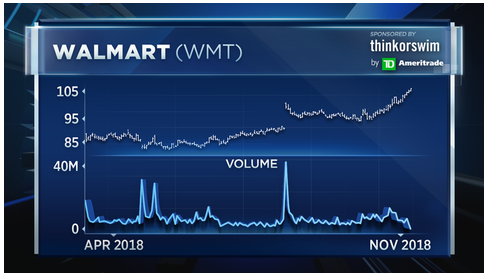 Walmart is reporting earnings this week, and one top technical analyst says the stock could soar on the results. After falling to its lowest level in over a year in June, Walmart has posted a major comeback. The stock is now less than 5 percent from its all-time high of $109.55 hit in January. "In many ways [Walmart is] a consumer staples play. We know it's a big grocery store and we know how well consumer staples are acting, so this is both an offensive and a defensive bet here," Cornerstone Macro's Carter Worth said Friday on CNBC's "Options Action." 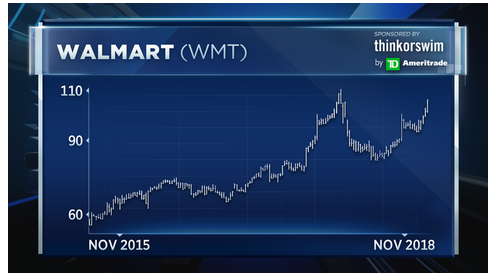 Walmart has been a top performer in the Dow amid recent volatility. The stock is up 16 percent during the last three months while the Dow is up just 1 percent. Furthermore, Worth noted that Walmart shares skyrocketed after the company's last earnings report. "Basically a massive move after a surprising result and of course on epic volume, which is what you want when you have a gap to the upside," he said. So I'm going to make the bet that we get a big move here in the next quarterly report." Despite selling off this year, shares of Walmart are up nearly 47 percent since 2017, outperforming the Dow's 36 percent gain and the S&P 500's 27 percent gain in the same period. According to Worth's the stock's chart shows a "massive head and shoulders bottom" suggesting it could poised to break to the upside. 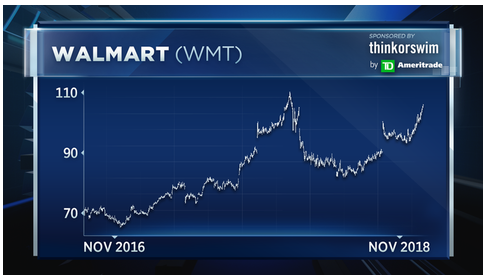 "I think Walmart is the place to be both offensively and defensively, make the bet long into earnings," he said.